Note: The Manfrotto 3021B Pro Tripod has been replaced by the Manfrotto MT190XPRO4 Tripod. 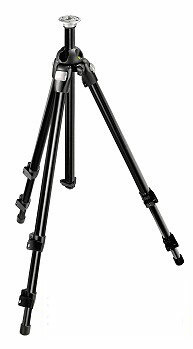 The Manfrotto 3021B Pro Tripod is a very good quality and very flexible tripod with a reasonable price. The Manfrotto 3021B Pro Tripod is quite solid. I like the firm flip clamps used to lock the tripod legs into position. Make sure you keep your fingers out of the way or you will get a good pinch. Bogen will replace the clamps with a non-pinching version for no charge if you contact them. The clamps are very quick and convenient to use. They make a firm snapping sound, so if you need to setup in silence, this is not the tripod for you. The center column has great flexibility - it is vertically adjustable (up, down and upside down) as well as removable for attachment parallel to the ground. The Manfrotto 3021B Pro Tripod legs can be independently spread to several positions. Spreading the legs wide open and mounting the center column parallel to the ground places the tripod head nearly to the ground. A small bubble level aids in leveling the Manfrotto 3021B Pro Tripod. The "B" in the model name denotes black legs. I felt black would better prevent light reflections on my subjects and be less noticeable by wildlife. I consider the Bogen/Manfrotto brand to represent a good value. My experience has been that they provide good quality products at a reasonable price. Be sure to consider the Manfrotto 3021B Pro Tripod if it meets your requirements. My Manfrotto 3021B Pro Tripod served me well until I replaced it with the stronger/stiffer Gitzo G1327 Carbon Fiber Tripod.